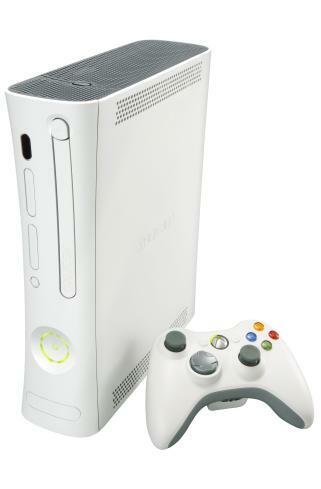 XBOX 360 CONSOLE. THE CONSOLE COMES IN A STYLISH COOL WHITE FINISH AND IS POWERED BY THREE PROCESSORS CAPABLE OF PRODUCING THE BEST IN HIGH-DEFINITION (HD) ENTERTAINMENT (UP TO 1080P FOR GAMING), 16:9 WIDE-SCREEN CINEMA ASPECT RATIO, FULL SURROUND SOUND, ANTI-ALIASING FOR SMOOTH ON-SCREEN TEXTURES AND "HIGH-DEFINITION MULTIMEDIA INTERFACE" (HDMI) OUTPUT. 60GB HARD DRIVE. THE 60GB DETACHABLE HARD DRIVE ALLOWS GAMERS TO SAVE THEIR GAMES AND STORE MOVIES, MUSIC, PICTURES, TRAILERS, LEVELS, DEMOS AND OTHER CONTENT AVAILABLE FROM XBOX LIVE MARKETPLACE, THE PREMIER ONE-STOP DIGITAL DOWNLOAD CENTRE FOR ENTERTAINMENT. UPSCALING DVD PLAYER. WITH AN HDMI CABLE (SOLD SEPARATELY), WATCH YOUR FAVOURITE NORMAL DVDS IN NEAR HIGH-DEFINITION USING THE UPSCALING CAPABILITIES OF XBOX 360. XBOX 360 WIRELESS CONTROLLER. THIS AWARD-WINNING, HIGH-PERFORMANCE WIRELESS CONTROLLER FEATURES THE XBOX GUIDE BUTTON FOR QUICK, IN-GAME ACCESS TO FRIENDS AND MUSIC. IT HAS A RANGE OF UP TO 30 FEET AND A BATTERY LIFE OF UP TO 30 HOURS. XBOX 360 HEADSET. THE HEADSET LETS FRIENDS AND FAMILY AROUND THE WORLD CHAT WHILE PLAYING GAMES, WATCHING MOVIES, OR SENDING VOICE MESSAGES ON XBOX LIVE. XBOX LIVE SILVER MEMBERSHIP. FOR NO ADDITIONAL COST, XBOX 360 OWNERS CAN CHAT WITH FRIENDS ONLINE, COLLECT ACHIEVEMENTS TO IMPROVE THEIR GAMERSCORES, SEND AND RECEIVE VOICE AND TEXT MESSAGES, AND ACCESS XBOX LIVE MARKETPLACE CONTENT SUCH AS GAME DEMOS AND HD MOVIES, AS WELL AS THE BEST IN DOWNLOADABLE GAMES FROM XBOX LIVE ARCADE. (BROADBAND INTERNET ACCESS REQUIRED.) ONE-MONTH SUBSCRIPTION TO XBOX LIVE GOLD. AN XBOX LIVE GOLD MEMBERSHIP PROVIDES A COMPLETE ONLINE ENTERTAINMENT EXPERIENCE. THOSE WHO SUBSCRIBE TO THIS PREMIUM SERVICE CAN ENGAGE IN COMPETITIVE ONLINE MULTIPLAYER MATCHES, TAILOR THEIR MATCHMAKING VIA FEEDBACK AND ACCOMPLISHMENTS, AND CHAT WITH AN ENTIRE GROUP OF FRIENDS AT A TIME.